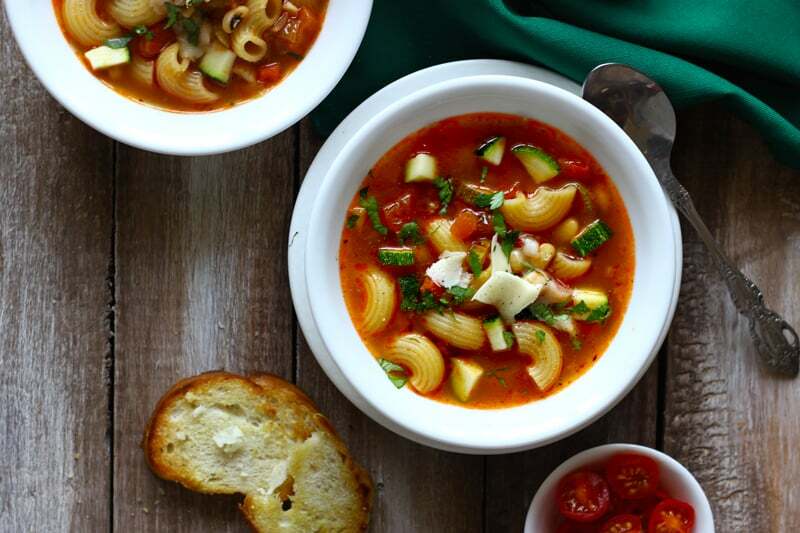 This Minestrone Soup is guaranteed to warm your soul and get your taste buds dancing. There is something utterly comforting about the minestrone soup. 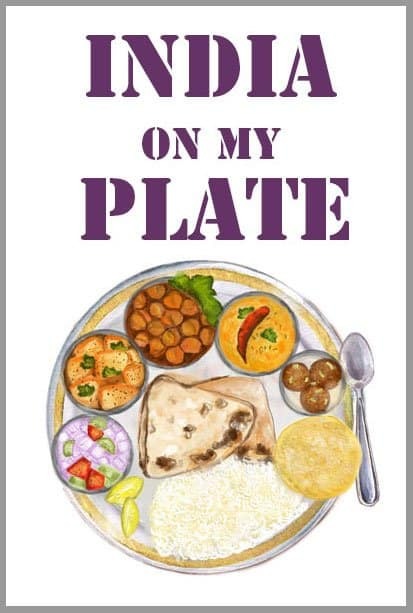 And when it is made right, you’ll go back for seconds and thirds, then you’ll be slurping big bowls of it for dinner and happily have it for lunch next day. My two little effortless tips that take this up a notch and get it ready in just 30 minutes. Tip number one is use boiled pasta water as the base for this minestrone soup. If you have vegetable stock well and good, if not, don’t worry, use freshly boiled pasta water seasoned with salt and a teaspoon of oil. And the second magical tip is to use tomato pasta sauce to flavor the soup. Don’t bother about the tomato puree or any other fancy sauce, simply add the best pasta/pizza sauce you have on hand to the soup. And let the magic of flavors happening. 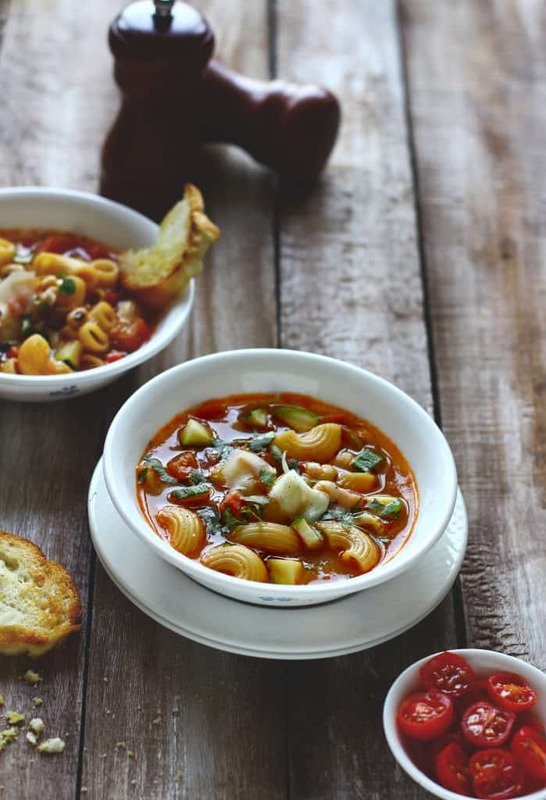 These two signature tips always produce a delicious minestrone soup in 30 minutes. Many minestrone soup recipes suggest cooking pasta and beans in the soup only. You can do so if time is not the constraint. For me boiling them separately and adding to the soup at the last minute works better to save time in the kitchen on a busy weeknight. 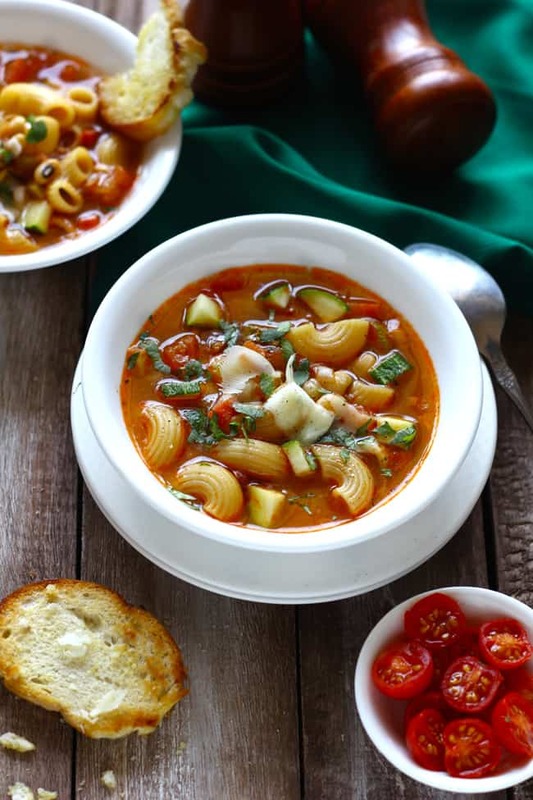 For the weeknight dinner, I am always sticking to recipes that are quick to prepare, fulfilling and absolutely comforting, like this 30 Minute Minestrone Soup. 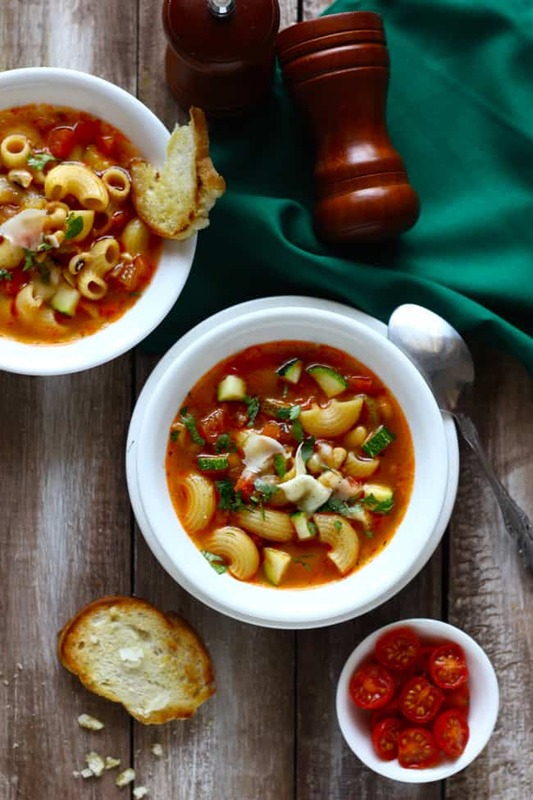 The Minestrone Soup is a classic recipe that will work with pretty much any combination of pasta, vegetables or meat. I like to keep mine totally vegetarian with the addition of lots of seasonal vegetables and of course, my favorite cute little elbow pasta. I feel the small, tiny shaped pasta work best for the minestrone soup. Feel free to work with different vegetables like carrot, spinach, snow-peas, fresh peas, kale and so on to create your favorite bowl of minestrone soup. Serving this minestrone soup with warm toasted bread is not optional. It’s an essential part of relishing the Minestrone Soup experience! 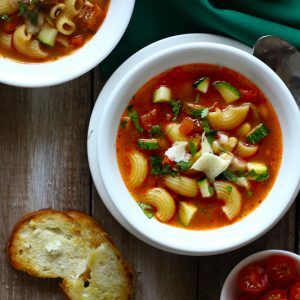 The Minestrone Soup is a classic recipe that will work with any combination of pasta, vegetables or meat. Boil pasta as per packet instructions. Drain and reserve the boiled pasta water. Heat oil in a heavy bottom saucepan. Add the garlic and cook for few seconds. Add the onion and cook until translucent, about 2 - 3 minutes. Next add the red wine vinegar and stir nicely to glaze the pan. Add the celery and zuchinni and cook until they begin to soften, about 5 minutes. Now add the diced tomato and cook for a minute. Add the pasta sauce, boiled pasta water, herbs and salt. Stir nicely to combine. Reduce the heat to low and simmer the soup for 10 minutes. Keep stirring at regular intervals. Add the diced and puree tomatoes and the stock to the pot and bring to a boil. Stir in the kidney beans and pasta. Simmer the soup for 5 minutes. Do not cook for too long after adding pasta. Taste and adjust the seasoning. Ladle the soup into the serving bowls. Garnish the minestrone soup with chopped basil and grated parmesan cheese. Serve Minestrone Soup warm with the slices of toasted bread.